Asian Criminological Society conference in Hong Kong on 25 June 2015. Find here more info. The RJIJ welcomes papers submission of academic research as well as practice and policy related information on RJ worldwide. Find here the guidelines for contributors. 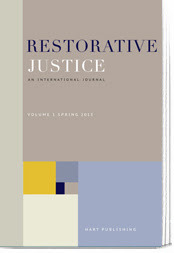 Members of the EFRJ can benefit of a reduced rate for the ‘Restorative Justice: An International Journal’. Find here more information of how to become a member of the EFRJ.